To skiers, snowmobilers and snow removal contractors, the snowfall warning we’re under right now is good news. Maybe not so much for anyone planning to travel today or tomorrow. Environment Canada says our entire region can expect up to 20 centimetres of new snowfall before it ends tomorrow afternoon or evening. As it falls, it could be heavy at times, and the warning includes the advice to postpone non-essential travel. Conditions are expected to improve by tomorrow (Friday) afternoon or evening. 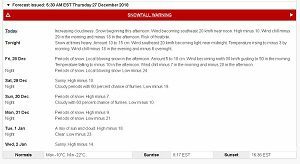 Enlarge this photo to read the official snowfall warning from Environment Canada. Municipal snowplows right across the region are gassed up and ready to go, to clear the roads from the new snow that we’re getting.